Innovation, risk, and growth – three principles of business that go hand in hand. To show you how it works, let’s take a look at a shining example: Michael Dell, the founder and CEO of Dell Technologies. 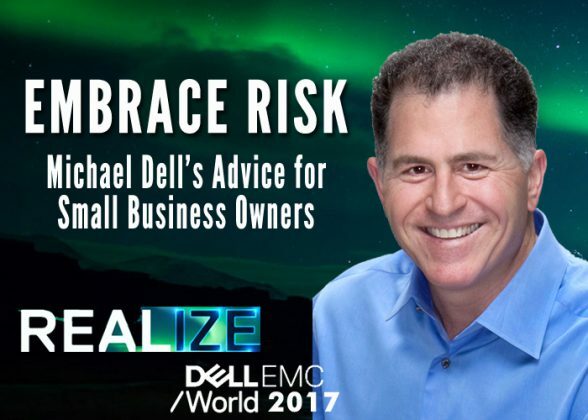 In the final episode of my Dell EMC World series, I get Michael’s advice for small business owners and entrepreneurs. Before we get to that, let’s take a look at his amazing journey. Michael Dell was intrigued by technology at a young age and got his first computer in 1980 when he was just 15 years old. When he was in college, he realized that computer companies were not yet selling directly to customers. Being an innovator, he decided to blaze down this trail himself. He began building computers and selling them to classmates, offering quality technology, affordable prices, and strong customer support. The business grew and grew, leading him to drop out of college so he could focus on it exclusively. In his first year, Michael made $6 million in sales. Flash forward to today and Dell is a household name all around the globe. The company has a presence in 180 countries, holds over 21,000 patents and patent applications, has 17 global research and development centers, and employs 138,000 team members. The list of awards, honors, and achievements is a mile long. The company reported $74 billion in revenue in the 2016 fiscal year, and Michael Dell himself ranks #38 on Forbes’s list of the wealthiest people in 2017. Embracing risk has worked well for Michael, so he says he’s going to keep doing what he’s been doing. Click play on the video above to hear this and other inspiration, including advice for small business owners who are still trying to get a handle on the latest technology. Erik Day - Tech Insights: Should I Use a Server or the Cloud?